That’s us – Eric and Tracy Whittington – with Labi. Both of us are U.S. diplomats working in Bolivia. The picture was taken at 13,500 feet! We met in the initial training class for diplomats in 2005, worked apart for 4 years (Tracy in Africa and Canada, Eric in the former Soviet Union and DC), and married in 2009. 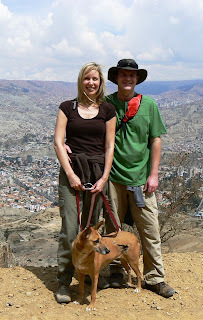 We moved with Labi to Bolivia in July 2011. Labi’s 8 years old now; she’s a girl; and your guess is as good as ours on breed. 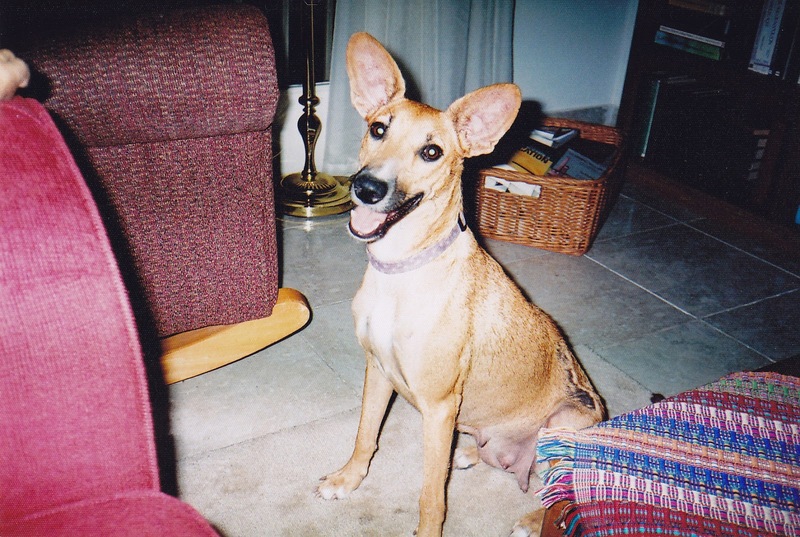 We know she’s part Basenji because she used to chortle and talk all the time when she was young. She only does that knows when she’s really annoyed with the cat. We’ll take pretty much any opportunity to talk about Labi and about ways to help street dogs like her. But today’s occasion is the release of our children’s e-book, A Street Dog’s Story, which follows Labi’s adventures as a former street dog. We also have a blog, StreetDogStory.com, where we try to draw attention to the plight of street dogs. We cover street dogs in the news, organizations that work to help street dogs, and even profile rescued street dogs and cats. Honestly? Hot cocoa. Nestlé's Quik. Neither of us like caffeine, and beggars can’t be choosers when you live overseas. We take the cocoa we can find. Any treats for you or Labi on this occasion? Of course. Labi’s always up for a tasty bone. Even if she’s just filled up on stolen cat food. How did Labi get her name? Any nicknames? 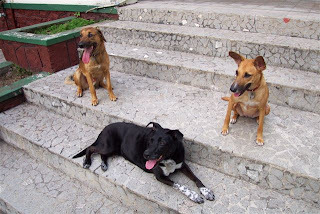 Most of the street dogs in Kinshasa (the capital of the Democratic Republic of Congo, where Labi was born) have floppy ears, but Labi’s are very large, and they stand straight up. It makes her look like a deer! Since Congo is a French-speaking country, Tracy and her friends always referred to the skinny street dog they saw as “la biche” or “the deer” in French. After being rescued, Labi’s name got shortened to “la bi” and then “labi.” Because her name rolls so easily off the tongue, we don’t really have a nickname for her. 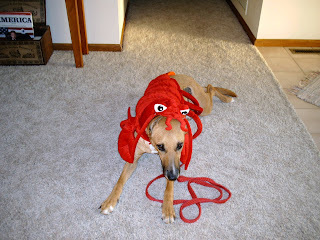 She does get called “lobster” from time to time, which is both due to the similarity of her name and the fact that she had a lobster costume for Halloween [photo right]. How were you and Labi united? While serving in Kinshasa, Tracy came across a street dog living on the banks of the Congo River. She was skinny, pregnant, and had a black scar on her hip where, Tracy later discovered, Congolese soldiers had tried to set her on fire. Tracy trapped her, rescued Labi’s puppy from her hiding place in a sewer, and took her home. She was in pretty rough shape. Today, Labi’s a healthy 40 pound dog, but she weighed 19 when Tracy got her off the street. Plus she had fleas and tapeworms! Tracy had her spayed as soon as she finished nursing, and her puppy went to live with a missionary couple in the same city. His name is Bambi, and the two dogs had play dates every Sunday for the remainder of Tracy’s time in Africa. Who are Labi’s best pet-pals? Labi’s step-brother is a not-yet-2-years-old former street cat, Linc, who we adopted here in Bolivia (He’s named for a character from the TV show Prison Break). To call him her best pet-pal is a bit of a stretch though, as Linc harasses her mercilessly. She routinely gives up her bed to him, tolerates him swatting her across the face, and even lets him eat her food. Her best friend in the world was Proby (“the Deputy” in A Street Dog’s Story), Tracy’s 10-year-old Lab/pit bull mix who helped rescue Labi in Congo. 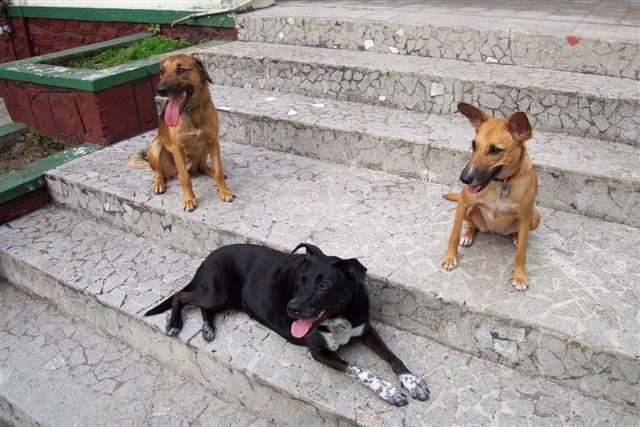 [photo left: Labi, Proby, and Bambi] Proby passed away in 2009, and Labi’s muzzle turned grey overnight. Since then, she’s had boyfriends – most recently Puma, the handsome mutt of an Embassy friend, who is head over heels in love with her, and a number of Bolivian street dogs who follow her around on her walks – but no dog has ever replaced her Proby. 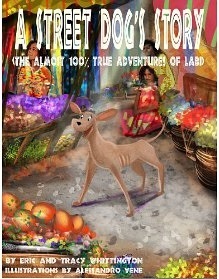 A Street Dog’s Story is a children’s e-book about Labi, her transition from street dog to pet dog, and how she found her mission in life – saving other street animals. It’s the first in a series of books based on her “almost 100% true” adventures. Right now, it’s available via Amazon.com, but soon we’ll release it for the Nook, iPad, and other e-readers. 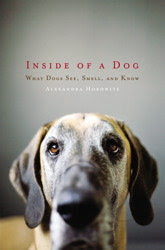 Twenty-five percent of all the proceeds from the sale of the book will go to the Humane Society International’s Street Dog Defender Fund to help other pups like her. Did you say squirrel? That’s Labi’s favorite word. The best day of her life was the day she arrived in the United States for the first time and discovered these magical delicious creatures. That day was not a good day for squirrel-kind, as Labi can climb trees – most squirrels don’t realize this and stop running far too soon. What is Labi’s best quality? Despite what people believe about street dogs and what she went through during her time on the street, Labi is incredibly gentle with all humans. She wins over everyone who meets her, including little kids who are terrified of dogs. Although she’ll jump on us, she seems to understand intuitively that she can’t jump on children. She won’t even try to bite the vet when she gets shots; she bucks like a horse to get away, but she never, ever shows her teeth. If Labi could change one thing about you, what would it be? She’d want us to stay in one place, preferably the United States. In Virginia, Labi got hour-long walks every day, and she usually saw squirrels, deer, and foxes in the park near our house. On the weekends, we took her on hikes to state parks and nature preserves. 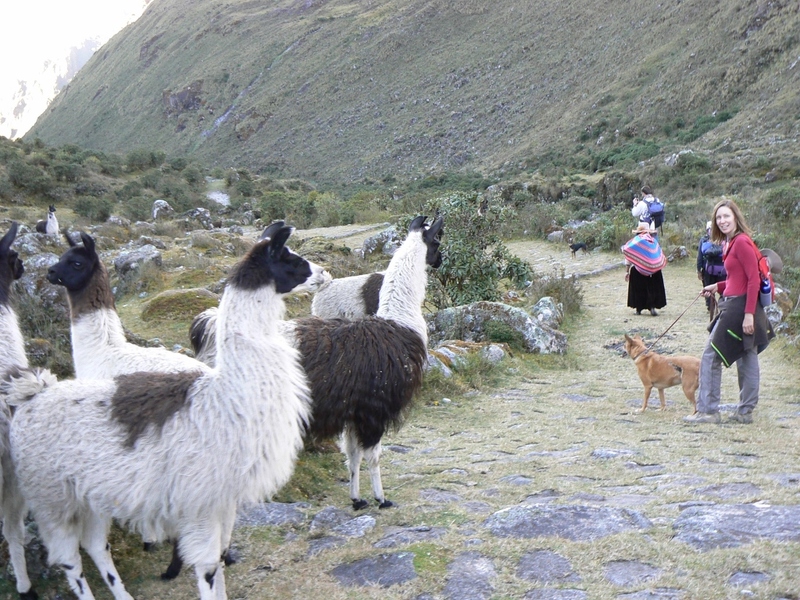 Here in Bolivia, she rarely gets to do more than a daily 30 minutes around the neighborhood. Not only are there packs of street dogs, some of which are dangerous, but there’s just a lot of concrete and very little natural space. 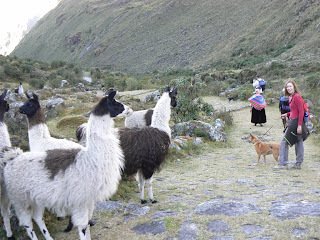 She did, however, get to go with us on 30 kilometer, overnight, Inca trail hike with llamas and sleep with us in a tent. That was pretty cool. If Hollywood made a movie about your life in which Labi could speak, which actor should do her voice? Without a doubt, Eliza Dushku, ex-Faith on Buffy the Vampire Slayer. Because she’s sassy, street-wise, and saves the world. If Labi could answer only one question in English, what would you ask her? We’d ask what she remembers of the Congo. Does she ever think about the river, the soldiers? Or is her brain pretty much occupied with treats, naps, walks, and avoiding Linc? Visit the StreetDogStory website and blog. Wow, I'm just in awe reading about your travels and dedication to street pups! My poor baby Max was once a stray and to know him today you just can't imagine him enduring a stray life! Thanks for all you both do to help these guys!! 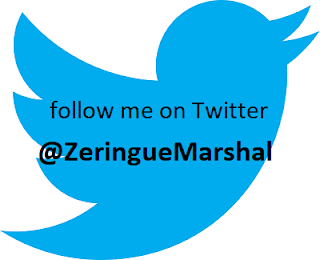 Ya'll rock! What a brilliant thing Tracy did saving Labi. We can't quite take in her bad start. Pawsome people. Bravo. We wish them well with what they do and we wish them well for their time in Bolvia. Great place. Have a fabulous Friday. What an amazing team they make. Very inspiring. Gotta get hat book. Wish it came in regular book form. But maybe we can read it on a friends kindle or something. Labi is beautiful. I love her story. And the llamas are way cool! I love Labi's ears and she is a tree climber too!